I’m a crafty mom. Not sneaky. I mean, I really like crafts. And sometimes, my love of crafts and homeschooling combine to make some interesting choices. 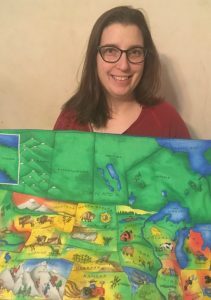 For over a year now, I have wanted to make a map quilt to go along with our history studies and I finally got around to it this weekend! 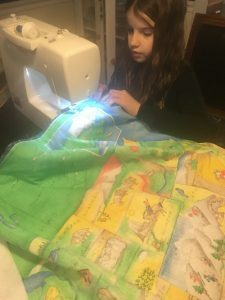 As it snowed outside, Anna and I worked on our new quilt to go with her American History studies. I did it all in one day and, while it isn’t perfect, it did turn out pretty good. 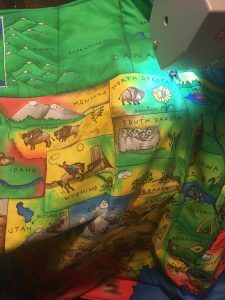 I am looking forward to snuggling under this quilt while we homeschool from bed this winter. 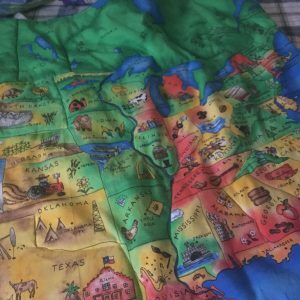 Here are the steps I followed to make my map quilt in a single day, in case you want to make one too. 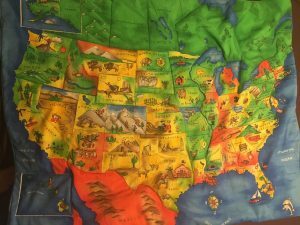 First, I got a US Map panel of fabric at JoAnn’s fabrics, 2 yards of batting, and 2 yards of flannel in a corresponding color for the back. I used a half off coupon and bought during a sale, so I got it all for about $15. Next, I cut the salvage off all the fabric and cut it to roughly the right size. 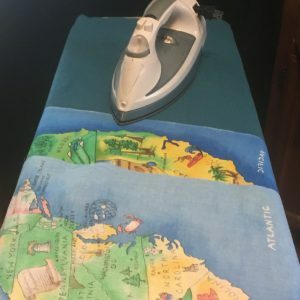 Then we ironed it. Once both the top and bottom fabrics were ironed, I cut them to be about the same size, along with the batting. 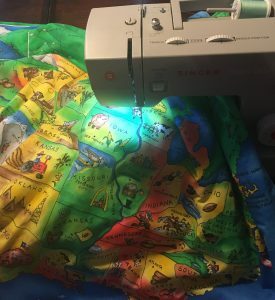 I stacked the fabrics on top of each other with the batting on bottom, then the backing, then the map on top, with the right side face down, and pinned them together with safety pins. 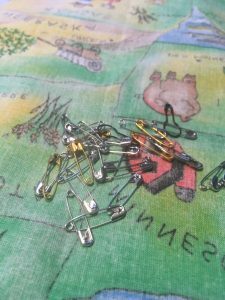 I used safety pins so my daughter wouldn’t get hurt trying to maneuver the quilt when she helped with the sewing. Next, we chose a starting point, and sewed around the edges of the quilt, leaving a gap at the top. Then comes the messy step of turning it right side out so the map is on top and the batting in the middle. After that, we ironed it again. 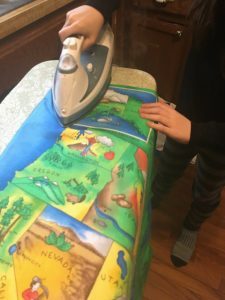 The critical part to iron is the edges of the gap where you turned it. Turn down the edges so that the raw edges are inside the quilt, and sew those into place, sewing along the edge of the quilt. Then top stitch the rest of the way around your quilt. At this point, I had some decisions to make. First I went around the squares that set off Hawai’i and Alaska, which gave me a lot of confidence. Then I did a nice job stitching along the nice straight part of the Western part of the Canadian border. But I went down the Mississippi River like I was the US Army Corp of Engineers, which taught me I really needed to stick with straight lines. and somehow the blanket now has an odd pucker in Maine. I told my daughter it was a mountain and the blanket now has texture. She pointed out that the map has mountain symbols, but not near mine. Too bad kid. I now appreciate about Canada that it has nice straight borders between some of its southern provinces. 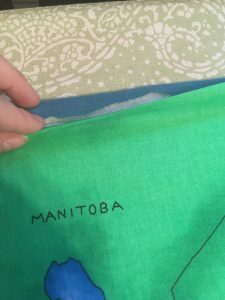 Alberta, Saskatchewan, and Manitoba all were nice to stitch along. I decided that next I should jump to the southern border and stitch that up to frame the US next. Unfortunately, the border with Mexico is not a straight line and again was pretty tricky. 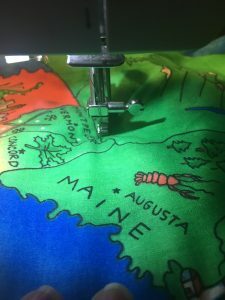 Anyway, I then discovered that places where my lines of sewing came together tended to pucker, so I decided that instead of going around every US state, I’d just take my sewing machine for a few cross country drives and go along the borders of several states to pin down the quilt and keep the batting from shifting. The batting I purchased said that it only needed to be sewn every 10 inches. So now that I had the top and bottom stitched, I really didn’t have to be too through, thank goodness. 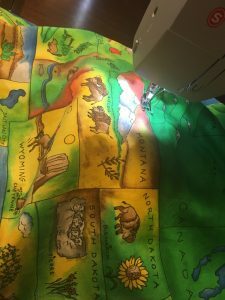 I took my sewing machine for a drive from the Canadian border down past North and South Dakota and went west along the border of Wyoming, Idaho, and Oregon to come out at the Pacific Ocean. My next drive took me from the Gulf of Mexico, up along Texas, past the top of New Mexico and Arizona and ended at Nevada. The East coast was a little more tricky. I drove the south side of Virginia to Tennessee, turned south and went between Alabama and Georgia to round the panhandle of Florida and get to the Gulf of Mexico again. I then decided to do the Southern border of Michigan’s mitten, and the line between Maryland and Pennsylvania, both because they were just nice and straight. And that completed my cross country driving. 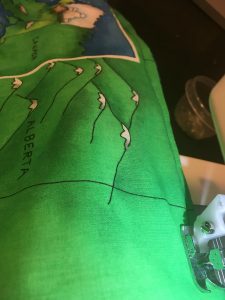 My sewing machine has now crossed several more state borders than I ever have. But I think I might be developing a goal here. 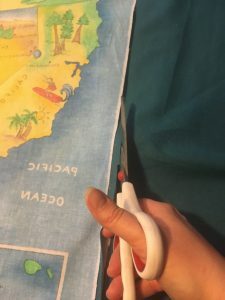 I got a pretty good geography lesson just sewing this thing together. 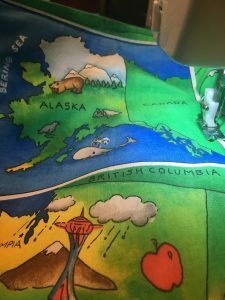 Tomorrow for school, I think I’m going to have my son take a toy car on a journey across this blanket to work on his geography skills. I don’t care if he is 11, I’m the teacher and it sounds fun to me! Want to see more about what Laura is up to? 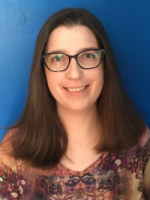 In between writing curriculum, Laura homeschools her own three kids, runs a scout troop, and crochets, among other things. And she shares about it on Instagram. 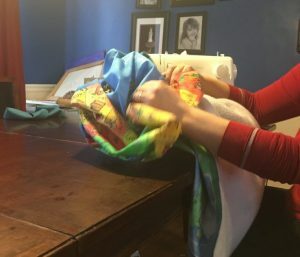 Check out Laura’s Instagram for a peek at what homeschooling at Laura’s house is like and what else she’s working on.